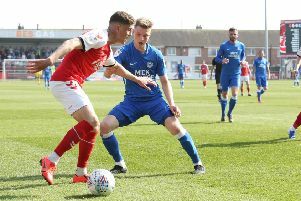 Posh full-back Michael Smith (left) in action at Oxford recently. Photo: Joe Dent/theposh.com. Peterborough United would be top of League One, but for conceding late goals in their last two matches. Posh led both Swindon (September 3) and Port Vale (September 10) 2-1 heading into the final stages of matches at the ABAX Stadium, but ended up drawing both games. Port Vale equalise against Posh from the penalty spot in the final minute. Photo: Joe Dent/theposh.com. Those four extra points would have seen Posh edge current leaders Bolton at the top of the table on goal difference. “We have to work on seeing games out better,” Posh right-back Michael Smith said. “We will always score goals, but clearly we have to be better at stopping opponents scoring as well. “Without those two late goals we would have been top of the table right now so it shows how close we are to being where we want to be. Posh are at in-form Sheffield United on Saturday (September 17) when Smith should start ahead of his rival full-back Hayden White. Posh struggled defensively when Smith was substituted midway through the second-half against Port Vale. A lack of form had nothing to do with the substitution. “I became a dad last week,” Smith stated. “it’s been an unbelievable experience as anyone who has had kids would know, but it’s been very tiring as I’ve been doing some night feeds.